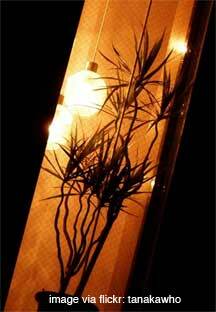 Answer: Sue, there are places where light from lamps is desired for plants mostly for decorative use. Hallways, dining areas, stairways, or wall niches can be perked up with plants spotlighted by portable or stationary lamps and lighting. Floor lamps with flexible arms can be used to focus lights on potted plants; a torchere might be placed to dramatize an arrangement in the foyer. Use a pair of lamps with cylindrical shades to focus attention on desk or buffet plantings. A fixed lighting fixture in the ceiling could spotlight a floral arrangement or a potted plant. Recessed ceiling lights can produce pleasant and dramatic effects. Pleasing, indeed, is a lovely plant or floral arrangement placed on the fireplace mantel in front of a lighted picture-frame, or accented by a circular ceiling light or a spotlight. Add surface-mounted reflectors and lighted valances to highlight a built-in planter bin, and you have quite a selection of ways with which to achieve a major point of room interest. Spotlights can do much to bring out after-dark beauty of your garden through a picture-window. You can purchase this type of fixture either for permanent mounting, or as a portable units for wall screens or valances.